Summer is officially over…cue the holiday music! It’s time for joy, festivity, family, friends, shopping, and executing a killer holiday social media strategy…well, at least for the marketers among us. Many social media marketers see holiday posts as “fluff.” But, the truth is, holiday posts can be some of the most valuable content you produce because holiday-themed storytelling is a great way to build and cultivate a growing and engaged audience. While many shoppers are into endless scrolling and browsing on ecommerce sites, many are also looking for a more engaging product exploration experience. The holiday season gives brands the opportunity to create emotional connections and imaginative opportunities with their consumers who will in return share these experiences across social and pique the interest of their peers. One of my favorite examples of this is the Miss Adventure Series by Kate Spade. Instead of just producing a print ad or tv commercial, Kate Spade has come out with a mini video series that uses a creative storyline and witty plot twist to make a connection with the audience. Enter Hollywood leading lady, Anna Kendrick, to star and you’ve got a viral marketing hit. Kate Spade made the video shoppable by posting links to all the items and outfits featured. The #MissAdventures campaign gives the Kate Spade brand personality and fans love it! The web series is an exact representation of the what the brand values are, quirky and fun, just like their audience. Another popular holiday marketing strategy is to run a holiday-inspired contest on social media in which participants contribute something in return for a reward. Make it simple for followers to enter, make the prize interesting and relevant on your buyers personas, and create a brand specific hashtag. This can be as easy as having an individual post a photo on Instagram/Twitter with your brand hashtag. Many years ago Sephora did a campaign called “Sephora Claus." 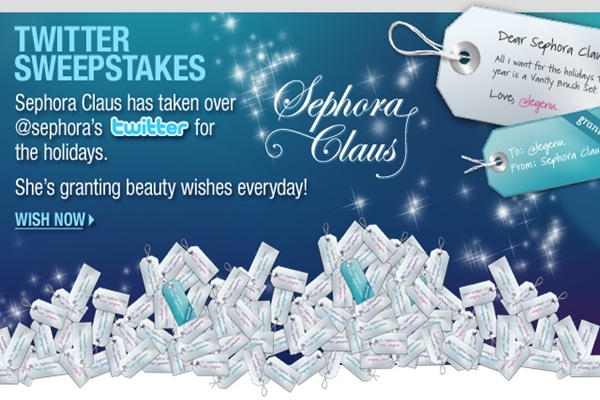 Followers were encouraged to tweet their holiday wishlist from the Sephora site with the #SephoraClaus hashtag. The campaign lasted 30 days and each day one new follower was picked as the lucky winner to have their wish granted. Not only did Sephora Claus spread holiday cheer, but it also helped drive their marketing efforts--as many people talked about what they wanted from Sephora during the holiday season. The holidays present countless opportunities to engage your audience with celebrations and festivities that occur during this time of the year. A great way to give your followers a tease is to provide them with a behind-the-scenes look. This could be posting videos and photos of your company’s annual office Christmas party, award ceremonies/volunteer events or simply just showing the process behind your upcoming holiday campaign.This helps humanize your brand, and make it more relatable. The holidays are certainly a time for giving, and the best way to do this is to support a charitable cause especially in today’s economy. Consumers are looking for a more meaningful brand experience and are supporting companies that not only reflect their social and environmental values, but also provide an authentic opportunity to give back. Consider a charity or cause you can donate a percentage of your revenue to for a portion of the holiday season. Look for opportunities to add a social spin to your effort and encourage your followers to share your posts with special promotions. Tis’ the season of giving! Macy’s “Believe” campaign invited kids to mail letters to Santa to benefit Make-A-Wish Foundation. They invited believers of all ages across the country to drop off a letter to Santa at their local Macy’s or submit one online. For each letter collected through Christmas Eve, Macy’s donated $1 to Make-A-Wish. On a more spooky and recent note, Chipotle hosted their Boorito Halloween fundraiser again this past year. Patrons were able to purchase Chipotle for $3 and all the food sale proceeds went to Chipotle Cultivate Foundation. While the clock is ticking closer to the Holidays, don’t let this season pass you without trying something a little different. You don’t need over the top production for a major video campaign, just consider small, creative wins to hook your customer and keep them coming back post-holiday.